Breastmilk is over 90% water. Babies breastfeeding well do not require extra water, even in summer, even in the hottest weather. If they are not breastfeeding well, they also do not need extra water, but require that the breastfeeding be fixed. It seems that breastmilk does not contain much vitamin D, but it has a little. We must assume this is as nature intended, not a mistake of evolution. The baby stores up vitamin D during the pregnancy and he will remain healthy without vitamin D supplementation, unless you yourself were vitamin D deficient during the pregnancy. Vitamin D deficiency in pregnant women in Canada is rare. Outside exposure also gives your baby vitamin D even in winter, even when the sky is covered. An hour or so of outside exposure during a week gives your baby more than enough vitamin D even if only his face is exposed, even in winter. Breastfed babies normally do not require solid foods before 6 months of age. Indeed, many do not require solid foods until 9 months or more of age, if we can judge by their weight gain and iron status. However, there are some babies who will have great difficulty learning to accept solid food if not started before 7-9 months of age. Because the six month old baby will also soon need to have an additional source of iron, it is generally recommended and convenient that solids be introduced around 6 months of age. Some babies show great interest in grabbing food off your plate by 5 months, and there is no reason not to allow them to start taking the food and playing with it and putting it in their mouths and eating it. 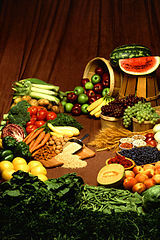 It has been the habit of physicians to suggest that babies be started first on cereals and then other foods be added. However, the 6 month old is far different from the 4 month old. Many 6 month old babies do not seem to like cereal if it is introduced at this time. Do not push the baby to take it, but offer other foods, and perhaps try again when your baby is a little older. But if he refuses, do not worry he will be missing something. There is nothing magic about cereal and babies do fine without it. Anyhow, your baby may soon be eating bread. The easiest way for the baby to get additional iron is by his eating meat. There is no advantage in this situation of giving formula by bottle and there may be some disadvantages. Even at this age a baby may start to prefer the bottle if he seems not to getting enough from the breast (if, in fact, he will accept a bottle). It would be preferable in this circumstance to give solids off a spoon rather than to give formula in a bottle. (Frequently, however, this situation can be remedied differently by improving the breastfeeding-get help!). If you wish to mix formula with solids, that does not cause the same sort of problem as giving it in a bottle. If the baby seems hungry after breastfeeding, feed him solids off a spoon. However, it may be possible with a few simple techniques, to get the baby gaining well, and/or to be satisfied with breastfeeding alone. Check with the clinic.